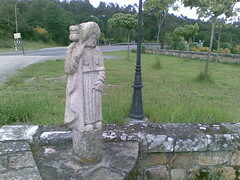 A nice statue in Taboada to remind me that Santiago is very close. Nothing much in this town. 2 bars and this provisional albergue. It's like sleeping in a cargo container with bunk beds. Would be wonderful if I can visit the inside. But I had spend too much time at the cafe and just after 12 pm found it was closed from 12-15 pm. That's Lena from Finland at the corner. 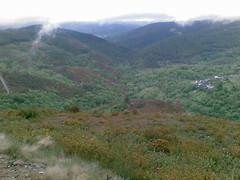 She had picked wild mushrooms from Ourense to Cea and has made a wonderful dinner for us with cream and potatoes. We supplied the wine and bread. Interestingly Lena only speaks Spanish (and Finnish) as she was was working with missonaries to South America in her past. She speaks no English but she does understand most of what I say. Famous for it's bread, it is a hearty, darker bread that is baked in small batches the traditional way for more than 700 years. However, it does get hard within a day, and after 2 days may even take your teeth out. 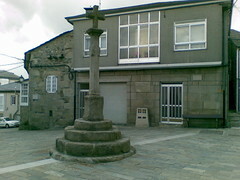 This had to be the best albergue in Galicia. 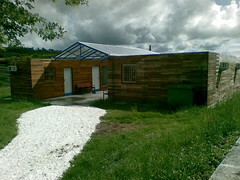 A modern interior with facilities, very warm inside, a veranda outside on the second floor and even a horreo to match. Augustino and friend. 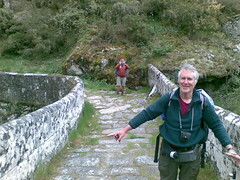 Thanks to them I got one of my walking pants that I have left at the albergue. 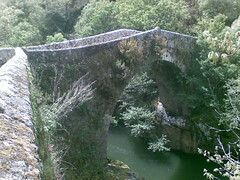 Leaving Ourense with the extremely high medieval bridge. 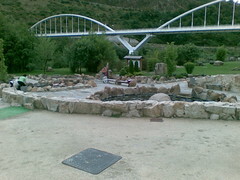 each way, the hot spring is free. 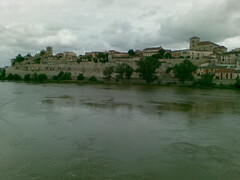 city is founded by the romans (Aquae Urentes). Aqua? Water? You guess it. Nice town with a library (for internet, hehe). Another over 30 km day, all thanks to having a menu lunch that allowed me to walk further in this weather. 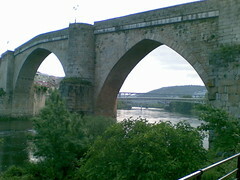 Will take it easier tomorrow with only 22 km to Ourense. I need the extra time in the afternoon to look around this city, do some overdued laundry, and to buy socks (the ones I am wearing are disintegrating). 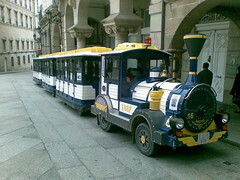 You know you are in Galicia when you start seeing these Horreos everywhere. They are elevated to keep the corn dry and away from mice. They come in all different sizes. More climbing today. 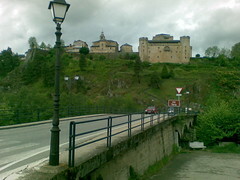 At the top is the town of Albergueria. 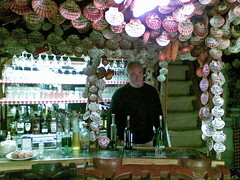 No albergue, but a cafe full of concha shells (symbol of St. James). Was told I am the first chinese there, though there were Japanese and also Korean. I have signed my name on a shell to add to his collection. Only rained intermittently. 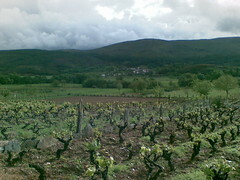 The wet climate of Galicia favors white wine. Had a taste today at the bar. Very good! For some reasons, they are not exported. So it's time to drink more white, which should go very well with the seafood here. The town where during the week of Lent, the festival has people with a big mask and a stick. When they hit you with it you are not suppose to retaliate. Probaby pagan in origin. 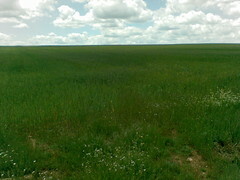 Even if it is only for 5 minutes so I can see the beautiful green mountains with many hamlets along the way. It makes the journey today worthwhile. Oh great. Not only am I wet, freezing cold, now I can't even see! And to add more punishment to myself, it was a more than 30 km day to Laza. I am betting that the lower altitude of Laza (just over 400 meters) might make things better. 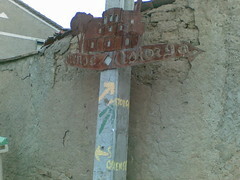 Left to Verin (about 35 km longer) and right to Laza (where I will be taking tomorrow hopefully). Even at this altitude, the weather is extremely cold (very unusual for this time of the year). I can't even type this properly as my hands are numb standing outside the local university near the albergue where there is an open wlan. 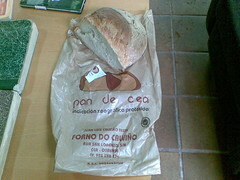 Galicia at last! Where many towns starts with and 'A' or 'O'. 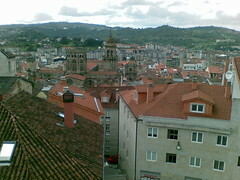 A typical modern Galician town with a long main street along the side of the mountain. 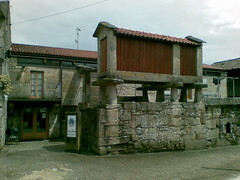 Reminds me of A Fonsagrada, the first town in Galicia along the Camino Primitivo. 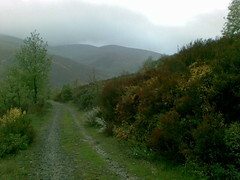 The rain, wet ground and the freezing wind is geeting into me. Will take a rest day if this keeps up. In any case I am 2 days ahead of schedule. Almost the top of the mountain looking back. Altitude of at least 1300 meters. That two similar height peaks in 2 days. 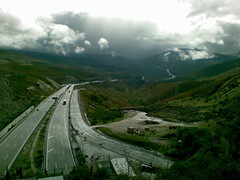 The highway goes into a tunnel about 100 meters underneath. 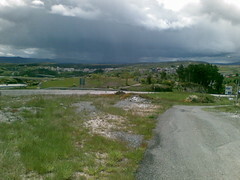 The other side behind me is Galicia. Luckily there is a portable heater to dry the clothes and especially my wet boots. Nice little town to take refuge from the day's walk. 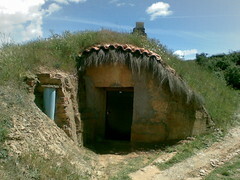 The animals are kept at the ground floor while the people live upstairs. 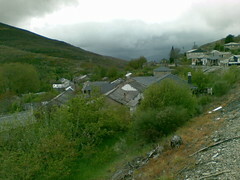 Photo taken near the albergue, the first house in this village. A nice day for climbing? Not! Cold, wind that is defintely below 10 c, and very wet. Galicia is still one day away. Already ferns can be seen even days before. 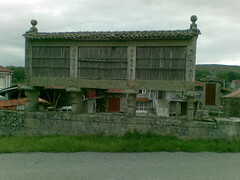 With slate roof on some of the houses, one thinks they are already in Galicia. 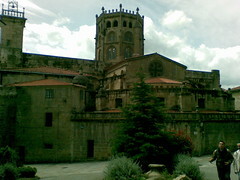 A well preserved fortified medieval town with cobblestone streets that slopes up to the fort and church on the hilltop. It's definitely a tourist spot (It has a Parador). Another reason why I ended the day here even when there is no albergue is that it makes the plan stops in the remainder of the camino much easier. Can't believe I ended up walking 42-44 km today! 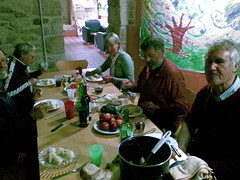 The many lovely villages, the big menu lunch, even the cold wind and the rain ironically helped. Still, I was tired when I arrived at 7.30 pm. No albergue in this tourist town so I am putting up in a nice tourist hostal (with free wifi). In any case I think deserved it after all this walking. So many nice things to see today, here a wood carving of seven sinners roasting in hell. Helps put one's mind away from the cold and the rain. The weather has been colder and wetter than expected. 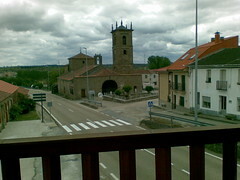 There are like 9 villages after Mombuey before Puebla de Sanabria, each just a few km apart. It's been raining on and off in the afternoon. Only 18 km for them today. They are taking it easy and plan to be in Santiago de Compostela on the 5th #une. After walking almost 9 km, this is a great place to have a break from the cold for coffee and also to stock up more food since today's is Friday. the mountain crossing I think in 2 days. The water is cool but very refreshing, especially from my feet. 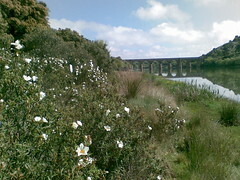 A nice stream before the dam. I visited the Domingo's bodega using his bicycle. It was not easy as I have to go against a bit of uphill and crosswinds. There are many bodegas around here. This is a typical small bodega next to Domingo's. They are mostly underground with machines to process the wine and also as a cellar to keep the wine. After 2 days of over 30 km walk per day, I've decided to take it easy today. Just under 22 km. 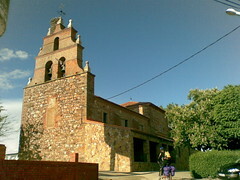 This private albergue is run by Domingo and Anita right at the edge of the town. Anita cook a nice lunch and dinner. Domingo has a bodega about 2 km away. 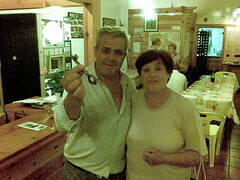 The wine here comes from his bodega and it's free flow in this albergue! 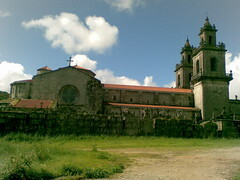 The beautiful Iglesia of San Salvador is currently covered and under restoration. 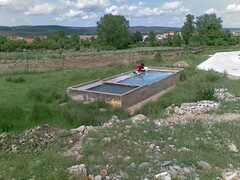 Here is the lavadero outside the albergue. This is the way the Spaniards have wash their clothes for hundreds of years. 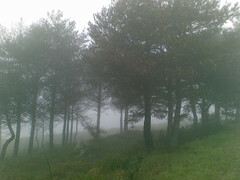 The morning was so misty the visibilty was like less than 50 meters. 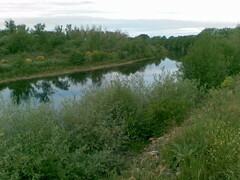 Luckily it cleared a few hours later when I crossed the river Esla and walked along the banks of the river. A perfect place to stop to look at the stork catching fishes along the river. Here in the town is the crossroad. 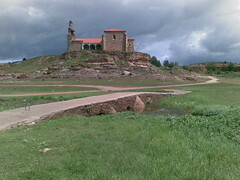 The Roman road goes north to Astorga joining the Camino Frances or west to Ourense. 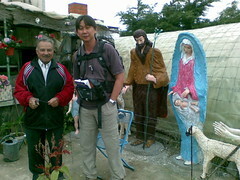 I will be heading west then north again to Santiago. 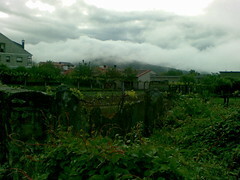 Nothing much in this one bar town other than a place to sleep after the rain and 35 km of walking. 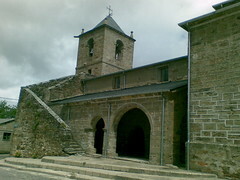 The ruins of a former fortified medieval town founded by the Knights of the Order of Santiago. Took shelter from the rain and tiny hail pellets outside the Ayuntamiento of Montamarta. 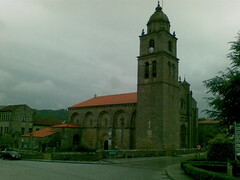 This is the iglesia on leaving the town after the rain. Unfortunately it rained again later. This is Jose. He has in his garden not only vegetables, but statues made with mythical or biblical themes. They are all made by him in his spare time at the tiny shed beside his garden. There is even a statue of a peregrino and a peregrina (not shown). 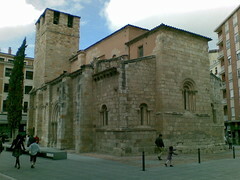 There are so many Romanesque Iglesia here. And the people lived so close to it. 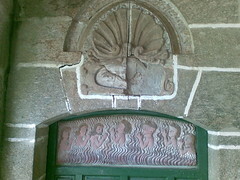 (picture). 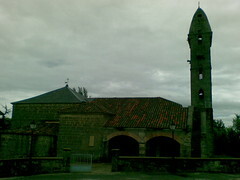 There is both a Santiago Matamooros and Santiago the pilgrim inside. 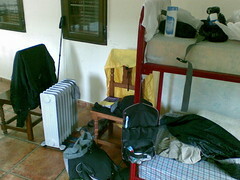 Was prepared to go a hostal when I found the albergue (new this year) next to San Cipriano. Just opened this January, it has 3 floors and 4 euros to stay. There are just too many beautiful Iglesias here to post. I will need to come back here again. Very surprise there are very few tourist in this beautiful city. This is the most beautiful city. 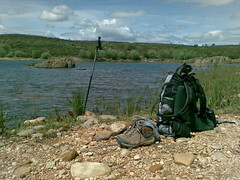 I have seen so far in this camino, and there are not many left. Since it's Sunday, the internet in the library is closed, but luckily the open wlan signal is still there. Had to ask the security guard to let me sit at the staircase (where the signal is strongest). A one horse (bar) town. 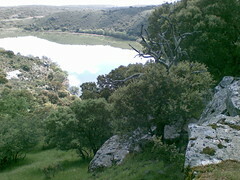 Just 19 km to Zamora. Nice albergue (not in my guide book). 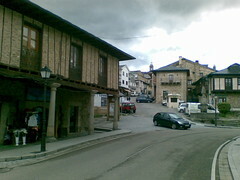 The people in the village have placed many milarios with a scallop shell and the village's name before and after the road to welcome pilgrims. Just me and the French couple (Pierre and Solange) in this albergue. At least they serve dinner at the bar. I'm starving after the long walk. 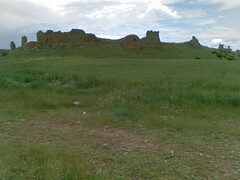 Glad I decided to walk 33 km, plus 4 km detour to see another castle. I've never seen clouds so beautiful before, and it runs all the way to the horizon.